Artaic’s mosaics come in standard 12” x 12” sheets, individually labeled with an easy to follow corresponding installation guide, for a simple installation. Installation should be performed in air temperatures between 41°F minimum and 86°F maximum. Installation surface should be a smooth uniform plane. Installation on a highly varied surface will be difficult and may cause undesirable results. Scored drywall of newly-built wall preferred substrate. 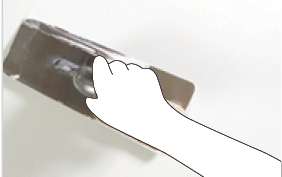 SEE STEP 1 FOR SKIMMING INSTRUCTIONS. For newly-built wall applications, the wall’s drywall is an adequate substrate to receive the mosaic. 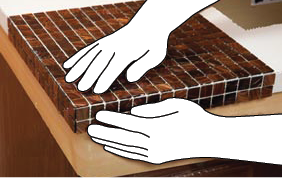 For existing wall or floor applications where the surface is structurally questionable or has a highly varied plane that will compromise the mosaic installation, add a layer of backerboard, such as Durock, to serve as the substrate to receive the mosaic. 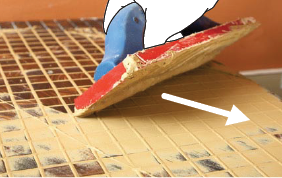 NOTE: A waterproofing/anti-fracture membrane needs to be applied to the uniform surface if the mosaic is to be submerged in water, or if anti-fracture or crack isolation properties are necessary. This typically consists of rolling or spraying a liquid, rubbery membrane onto the uniform surface prior to mosaic installation. Please follow manufacturer’s instructions on waterproofing membrane application. than one section of the grid. 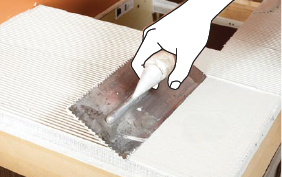 Second coat: create even ridges in the setting material by “combing” the material with the notched edge of the trowel. Thorough cleaning may involve removing excess setting material from the mosaic’s joint with a knife, as well as cleaning off all dust and particles. 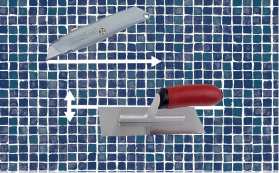 Spread grout from the bottom up in a diagonal direction using a small trowel. 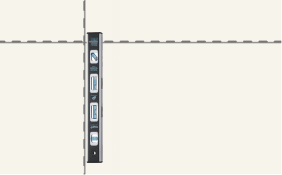 Expansion joints should be installed at all “changes in plane” of the mosaic and where the mosaic meets an adjoining surface, such as in a corner. Fill these space(s) with a silicone caulking sealant in place of grout to create expansion joints at these locations. 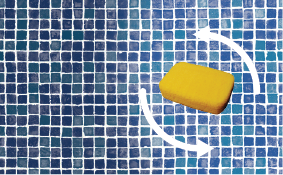 NOTE: Cleaning methods vary based upon the type of grout used in the installation. For example, a urethane grout must be cleaned earlier and more frequently that cementitious grout. Please follow the cleaning instructions provided by the grout manufacturer.